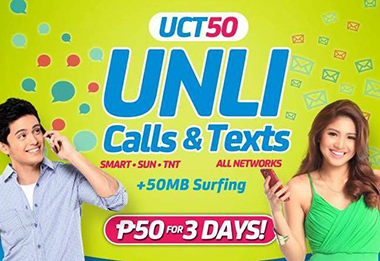 Have you heard the of SMART Prepaid UCT50 : UNLI Calls and Texts promo? It could be the best offer from Smart that will suit your mobile lifestyle. Stay connected with your loved ones all day for 3 days! Update your status, tweet and browse as the promo comes with mobile data. All of these for only an affordable price! Load up now and boost the power of your bonding moments at the tip of your fingertips! For more promos and other features, visit www.unlipromo.com or you can check Smart Communications Facebook Page and Unlipromo Official Facebook page for more updates. Bakit hindi makatawag? Sayang pera! 2 times ako nag register ng UCT 50 sa 6406, d nman mgamit, consumed n agad.. yung load ko nagamit na ng network nyo pero ako d ko magamit promo nyo.. kkaloko nman kau.. ganyan ba ka-inutil kumpanya nyo?